Size : 15.3 x 22.8 inches. / 38.8 x 58.0 cm. 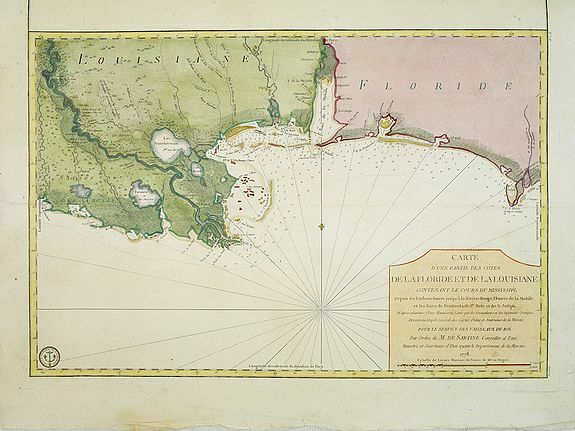 Description :A well engraved and highly detailed chart of part of the Gulf Coast, dated 1778 that was issued in Neptune americo-septentrionale. The chart covers the area between St. Joseph Bay and Vermilion Bay. Numerous rivers, bays, islands and lakes are identified, as are the towns/forts of Pensacola, Mobile, Biloxi and New Orleans. A few historical notes are included, such as F. Crevecoeur Abandonne par les Francois en 1718. It shows soundings, anchorage's, channels, shoals, navigational sightings. Engraved by Petit, engraver for the Depot Générale de la marine is noted as such on the map. Sellers & Van Ee, Maps and Charts of North America and the West Indies, 1750-1789: 1611.